Goodmans GCR1930DAB review | What Hi-Fi? Sorry, Goodmans – we fully appreciate you often manage to squeeze surprisingly good performance from incredibly low priced products, but this radio leaves us utterly underwhelmed. Straight from the box, the rather plasticky egg-shaped unit looks scarily complicated. It's all buttons and switches – so many in fact that they take up the front panel as well as the sides – and the feeling of clutter isn't helped by the twin displays, one for radio information, the other for the two-alarm clock. What's more it's just as fiddly to use. It also sounds weedy, despite its stereo speakers to the rear – not all clock radios are stereo, but this seems a strange arrangement – and max volume is strangely quiet. Neither is reception great: despite the the T-shaped wire aerial it can miss stations while seek tuning. 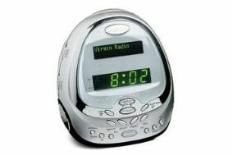 Yes, this clock radio has a large display – well, two of them actually – but that and its price are the only pluses.